Xenoblatta had the most liked content! @emmett They are too many colonies? Just to be sure... you should take them to another place while she do that ? Hey @stanislas... Yes, they died shortly before this picture, and some hours after offering non-pealed fruits.... ? Exactly! I use to prepare a lot and freeze them for a lot of time... Works perfectly for me ? I have never had a colony with only males, but I have seen this kind of homosexual behaviour in colonies with both sexes... ?‍❤️‍? ?‍❤️‍? Help me identify these nymphs please ! I'm not good with hissers... ? Maybe @Hisserdude can tell you? Wow! I'm so sorry @Test Account I have lost insects for those horrible pesticides already... Maybe cleaning with vinegar + sodium bicarbonate diluted in some water? 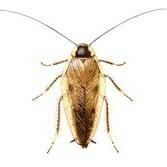 Is what I use to eliminate pesticides in the fruits before offer to my roaches... ? Very good point... I have noticed the same in some cases. At least in large populations of B.dubia and N.cinerea I've seen is because they may increase the temperature of the colony just because their own activity... which may give them an additional impulse. ? Those are pretty nice ? How it's been your experience of breeding H.reflexa? Do they breed well for you? ? Any roach species you mix?